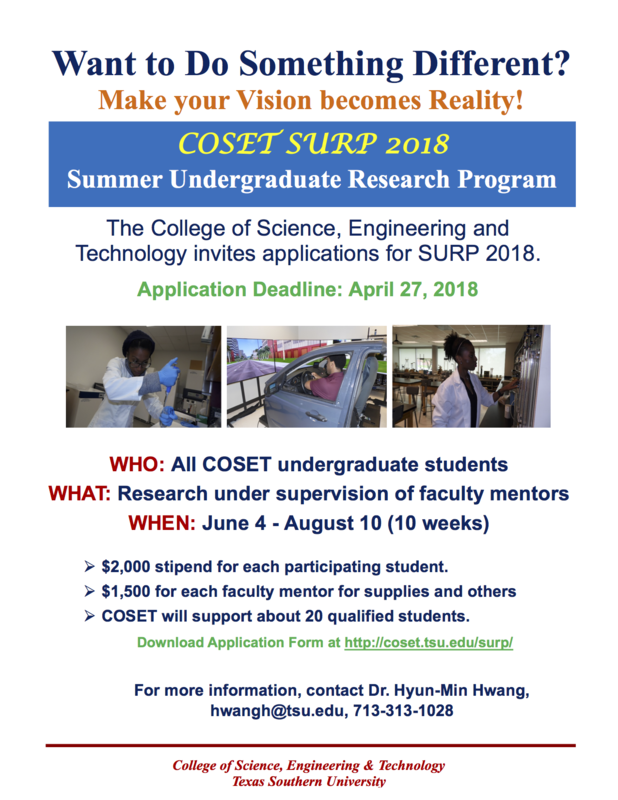 The College of Science, Engineering and Technology is proud to announce that the Summer Undergraduate Research Program (SURP) will again be offered this 2018 summer. We welcome students and mentors who are interested in doing research to apply. We encourage students in the Sciences to get involved in meeting the challenges of scientific investigation of current phenomenon or solving problems that may deem necessary for the future. Doing research as an undergraduate provides an experience that students will be able to use as they move on to graduate study. As we move further into this age of technology it is important to peak the curiosity of our students to look beyond the present and prepare for the future, to ask the questions and become involved in research that will eventually take our understanding to new heights. We applaud those students and mentors who have been a part of this program in the past and trust that making new discoveries will continue to the goal of their inquisitive minds. The COSET will support about 20 qualified students for this 10-week (June 4-August 10) research program. Undergraduate students enrolled at least one year in any departments in the COSET can apply for SURP. Overall GPA should be 3.0 or higher. Students must contact faculty members in the COSET to select a mentor. Any faculty member in the COSET can mentor an undergraduate student. Interested students should submit application materials by April 27, 2018, either as an electronic copy (email attachment) or as hard copy. All applicants will be interviewed between April 30 and May 2, 2018. Students must attend an orientation session on June 4, 2018 in Science Building room 303H. Students must attend a laboratory safety training workshop on June 4, 2018. Students are required to attend weekly seminars and workshops designed to teach them how to better prepare resumes, posters, manuscripts, and other documents. Students in the program are expected to work for approximately 25 to 30 hours per week. Students are required to submit weekly progress reports to Dr. Hyun-Min Hwang by Friday of each week. All students are required to give oral presentations on their research results at the symposium scheduled for August 10, 2018. Students are also required to present posters at TSU Research Week 2019, which will be schedule for the last week of March 2019. Each student is required to submit a 4-5 page research manuscript for publication in the 2018 Proceedings of TSU COSET SURP. Each participating student will receive a $2,000 stipend. Students who do not complete all the program requirements, or drop out of the program will not receive the stipend. Each faculty mentor will receive support (up to $1,500) for supplies. A statement of agreement signed by student and his/her advisor [COSET-SURP-2018-Form]. Application materials should be sent by email (hwangh@tsu.edu) or delivered to Dr. Hyun-Min Hwang’s office, TSU Science Building room 203A. Please download a printable post or the whole COSET-SURP-2018-package.